We think we’ve got to know London quite well over the last few years with our frequent stopovers, but how wrong we are!!!! One of our favourite questions we’ve taken to asking different friends is …….. “what do you like to do most when you’re in London”? The ideas keep rolling in!! With a population of almost 9 million people (in the Greater area) London is the third largest city in Europe behind Istanbul (14 million) and Moscow (10.5 million). By far the largest city in the UK and is internationally the most visited city in the world!!! In terms of culture and people it is known as one of the most versatile in the world with over 300 languages spoken. Something we always enjoy hearing is the variety of languages and accents! Also one of the worlds largest financial centres and cultural capitals with a leading reputation in arts, fashion, entertainment, education, research and development and tourism. Not sure if I can remember just how many markets in how many countries we’ve been to over the years but this was something special. In saying that I never tire of the them and taking time to be around the locals doing their daily or weekly shop is always a pleasurable experience. 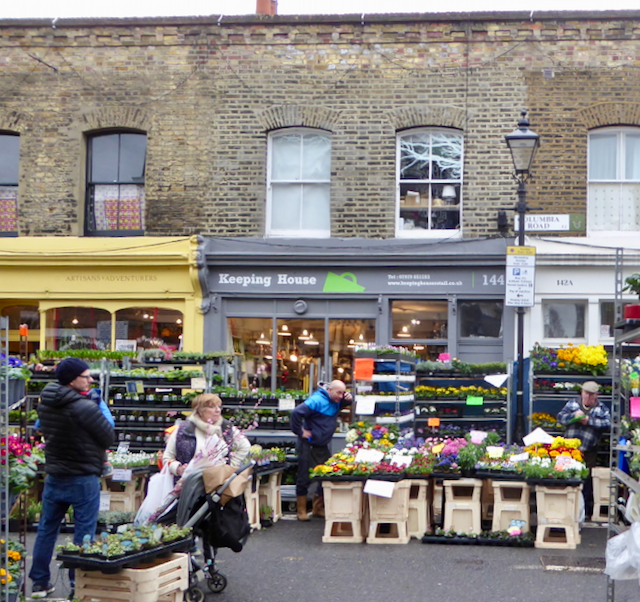 We’re up with the sparrows on a Sunday morning heading for Columbia Road Flower market in the Eastend and you really do feel like the three little pigs scenario getting there really early before the crowds!!! You're even warned about how full the tube might be as it gets incredibly busy. So we take it literally and are there almost having to knock on the doors for the cafes open!! But the atmosphere is so relaxed and friendly, different from a week day in London, that we share a table with some locals who come regularly. They're passionate about their city and really delight in recommending a few of their favourite spots to visit. 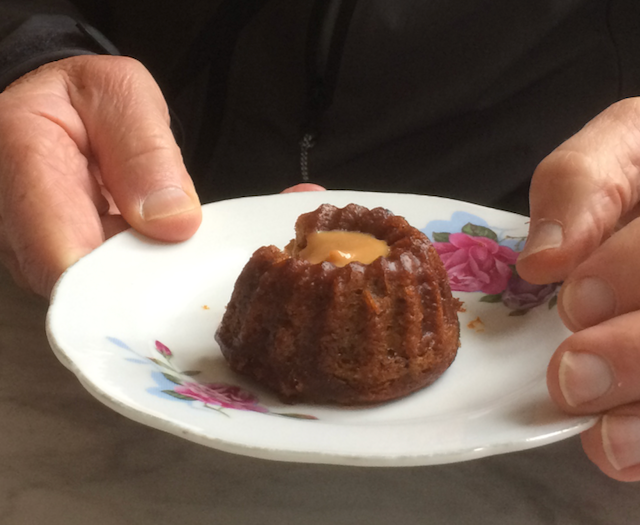 Been wanting to try one of these and found the perfect place (thats if not in France) a canele, a delicacy originating from the Bordeaux region - ooh simply delicious! Out on the street its still chilly but the setting up is in full swing and bucketsful of beautiful flowers are overflowing onto the narrow streets. 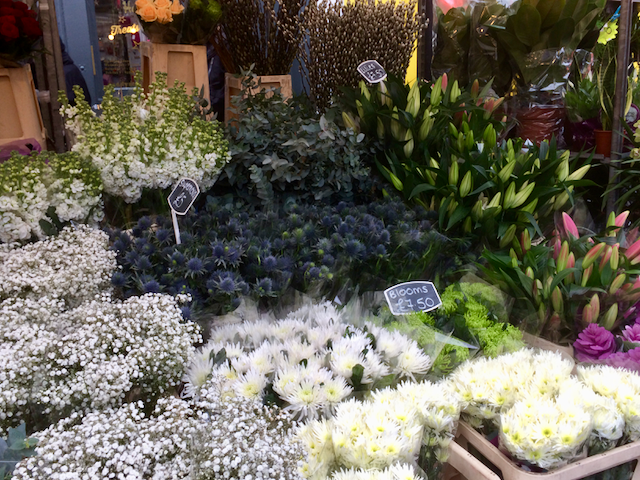 Its a visual feast for the eyes with so much colour and variety and the wafts of different scents is sublime. The banter from the stall owners is such fun to listen to and as the street fills up we’re treated to some great busking. Locals and regulars mainly at this time of the day picking up their flowers for the week but by mid/late morning when we leave its heaving with people like us too. 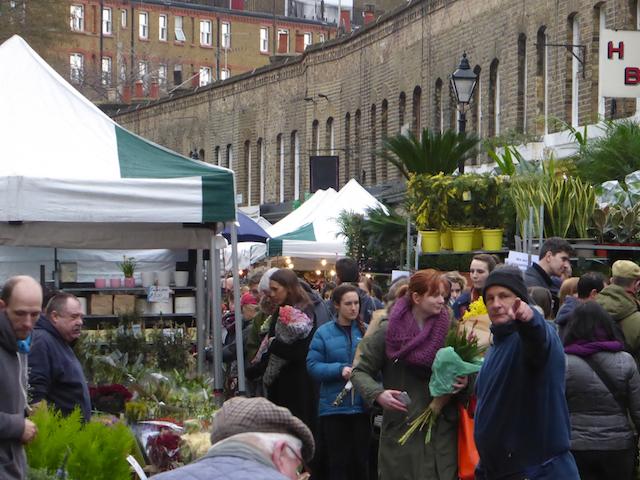 Columbia road was initially the track that was used to drive the stock to Spitalfields slaughterhouse and over the years has seen many sights. The Victorian shops that line the cobbled street were built in the 1860’s and are now full with crafts shops, cafes, deli’s, small galleries, vintage stalls and all sorts of fascinating designs. So as the market fills up and starts to hum we can head behind the stalls and discover the other treasures. From here we wandered on down to Shoreditch for a whole different experience. Known as one of Londons creative hubs, it still maintains its gritty, slightly grungy feel to it. Graffiti on the walls, artisan coffee shops, vintage boutiques and independent shops interspersed with fascinating up and coming local designers and high end fashion. Just taking in the the fashion junkies and trendsetters on the street was a joy of its own!! No hurry to leave this area. Next stop Brick Lane and we timed it well as Sunday is Food Market day and its buzzing. The smells are intoxicating, you feel like you should just close your eyes and follow your nose!! The queue to a rather ordinary looking bagel shop was out the door and meters down the street!! 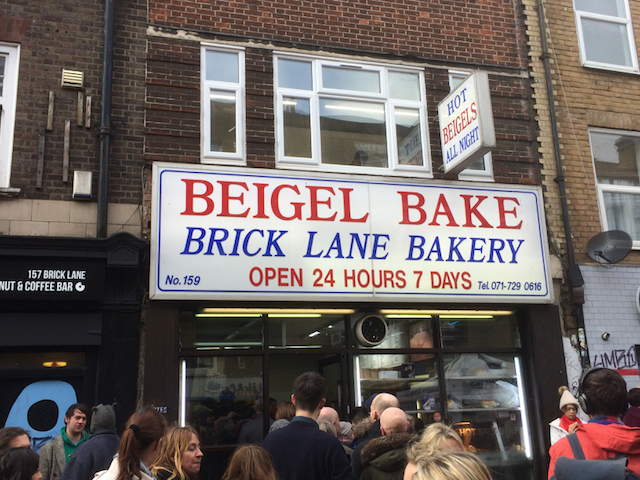 It turns out to be Beigel (Bagel) Bake an East End institution. The spelling of Beigel is Yiddish, as this is one of the few signs left from what was a very strong Jewish community in the last 19th century. Beigel Bake is open and baking 24 hours a day, with a reputation for serving the best Salt Beef bagels, (nowadays more popular than the traditional Salmon and cream cheese), ever. I read they use go through over 20,000 paper bags a week!! No desire to join that lengthy queue but I would’ve loved to have tried one. Not only was Brick Lane’s food choices amazing but the live entertainment and busking incredible. David followed his nose to the Rib Man, time to get his fill of red meat which may be lacking a bit these days ??? Turns out this fellow is known as the ‘Big Daddy of Londons street food scene’. With his out door raised pork thats been slow cooked as ribs then to top it off and crate ‘perfection’ there’s his ultimate ‘Holy …. Sauce”!!!!!! He was in seventh heaven.